EWG scientists reviewed Desitin Rapid Relief Diaper Rash Ointment, Creamy for safety according to the methodology outlined in our Skin Deep Cosmetics Database. We assess the ingredients listed on the labels of personal care products based on data in toxicity and regulatory databases, government and health agency assessments and the open scientific literature. 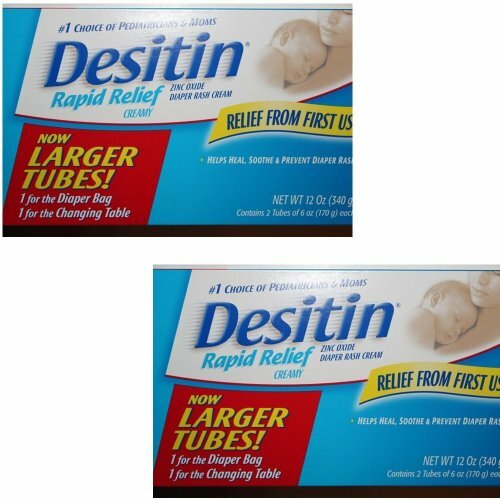 EWG's rating for Desitin Rapid Relief Diaper Rash Ointment, Creamy is 5. Change wet and soiled diapers promptly. Cleanse the diaper area. Allow to dry. Apply ointment liberally as often as necessary, with each diaper change, especially at bedtime or anytime when exposure to wet diapers may be prolonged. Store at 20 to 25 degrees C (68 to 77 degrees F). For external use only. When using this product do not get into eyes. Stop use and ask a doctor if condition worsens; symptoms last more than 7 days or clear up and occur again within a few days. Keep out of reach of children. If swallowed, get medical help or contact a Poison Control Center right away.